It looks like the plastic bottle is here to stay, despite publicity about bisphenol A and other chemicals that may leach into liquids inside the bottle. The amount of plastic used to make the bottles is so enormous that estimates of total amount of plastic used is staggering. Earth911.com says that over 2,456 million pounds of PET was available for recycling in the United States in 2009. Any way you look at it, that’s a lot of bottles. Those bottles exist – they’re not going away, except perhaps to the landfill. So shouldn’t we be able to use them somehow? We have already posted blogs about plastics (especially recycled plastics) last year ( to read them, click here, here, and here ) so you know where we stand on the use of plastics in fabrics. All in all, plastic recycling is not what it’s touted to be. Even if recycled under the best of conditions, a plastic bottle or margarine tub will probably have only one additional life. Since it can’t be made into another food container, your Snapple bottle will become a “durable good,” such as carpet or fiberfill for a jacket. Your milk bottle will become a plastic toy or the outer casing on a cell phone. Those things, in turn, will eventually be thrown away. So the reality is that polyester bottles exist, and using them any way we can before sending them to the landfill will prevent the use of more crude oil, which we’re trying to wean ourselves from, right? Recycling some of them into fiber seems to be a better use for the bottles than land filling them. Plastic bottles (the kind that had been used for some kind of consumer product) are the feedstock for what is known as “post-consumer recycled polyester”. Even though plastic recycling appears to fall far short of its promise, recycled polyester, also called rPET, is now accepted as a “sustainable” product in the textile market, because it’s a message that can be easily understood by consumers – and polyester is much cheaper than natural fibers. So manufacturers, in their own best interest, have promoted “recycled polyester” as the sustainable wonder fabric, which has achieved pride of place as a green textile option in interiors. Recycled post consumer polyester is made from bottles – which have been collected, sorted by hand, and then melted down and formed into chips, sometimes called flakes. These chips or flakes are then sent to the yarn spinning mills, where they’re melted down, often mixed with virgin polyester, and and spun into yarn, which is why you’ll often see a fabric that claims it’s made of 30% post consumer polyester and 70% virgin polyester, for example. As the size of the recycled polyester market grows, we think the integrity of the sustainability claims for polyesters will become increasingly important. There has not been the same level of traceability for polyesters as there is for organically labeled products. The GRS provides a track and trace certification system that ensures that the claims you make about a product can be officially backed up. It consists of a three-tiered system: Gold standard – products contain between 95 percent to 100 percent recycled material;Silver standard – products contain between 70 percent to 95 percent recycled product;Bronze standard – products have a minimum of 30 percent recycled content. Plastics make up 17.8 % by volume of what’s thrown into California landfills. While consumers are increasingly snapping those Evian bottles off the shelves, they toss the empties into the trash bin more often than the recycling bin. The recycling rate for plastic bottles is only 16 percent — miserably low compared to glass and aluminum — even though consumers can redeem their used plastic bottles for the same CRV (California Refund Value) rate as other containers. California cities and counties have an incentive to recycle as much material as possible. A 1989 law requires that municipalities reduce the trash they send to landfills by 50% or face hefty fines. Diversion, then, becomes the magic word. But from the point of view of recyclers, accepting some types of plastic is more trouble than it’s worth. For example, plastics coded 3 through 7 — cottage cheese, tofu, salsa and yogurt containers — are particularly difficult to recycle profitably. So why take these additional containers at all, especially when their volume is low? According to Mark Loughmiller, executive director of the Arcata Community Recycling Center, the answer is public pressure. “I fought it. There are no domestic markets for it. At a point you get tired of being harangued by people coming in trying to quote unquote “do the right thing.’” They don’t want to throw anything away, he said, and that’s all well and good. But a more appropriate position might be, “I shouldn’t buy it in the first place,” he suggested. The plastics collected at the Arcata sites are baled and stored for about a month until they fill a 12-ton truckload, Loughmiller said. The truck typically contains 5 tons of milk bottles (the number 2s), 7 tons of soda and water bottles (the number 1s), and about three-quarters of a ton of the so-called “mixed plastics,” the 3s through 7s, which are baled together. They then make their way to Ming’s Recycling in Sacramento (which also takes all of the plastics from Humboldt Sanitation in McKinleyville). Kenny Luong, president of Ming’s, said his center has 40 or 50 suppliers in California and another 30 to 40 elsewhere in the United States and Canada. Almost all of the plastics that come into Ming’s are sold to brokers in Hong Kong, who pay to transport it via container ship from the Port of Oakland to China. The transport is cheap because China exports far more to the United States than we do to them; the ships traveling back to China have plenty of room. “It’s enough to cover the transport to the harbor, that’s pretty much it,” Luong said of the mixed plastics. He would prefer not to take those at all. But a change to state law in 2000 expanded the list of beverages included in the California Redemption Value program. And if the bottle has a “CRV” on it — even if it’s a number 3 or 4 plastic — a certified recycling center must accept it and pay the refund to the consumer. One of his brokers has visited some of the locations in China where plastics from Humboldt end up. Doug Spitzer is the owner of Monarch Enterprises of Santa Cruz, which is affiliated with the gargantuan paper company Boise Cascade. He sells plastics to Chinese recyclers and ran a plastic film-recycling factory himself outside of Guangdong in the early 1990s. “Most of our material goes through Hong Kong into that closest province [to Hong Kong], which is Guangdong,” Spitzer said. One factory will typically limit itself to one type of plastic, and one village might have most of its residents involved in that type of recycling, he said. “Within this one town outside of Guangzhou [in Guangdong province], when I was there, my partners were telling me there were at least 3,000 plastic film processors there, and they’re right next door to each other. It’s a small village; they all process it.” The facilities range from a mom-and-pop operation that takes one container-load per month to very large, comparatively modern factories. One Spitzer saw when he visited four years ago involved soda bottles: The workers would break open the bales, women would sort the bottles by color, a “guy with a machete” cut the tops off, two other men scraped labels off, then the bottles were ground into pellets and melted down. It was not the kind of place that would be approved by the U.S. Occupational Safety and Health Administration, Spitzer said. There are some facilities in the United States that recycle soda bottles and milk jugs “if the material is clean enough,” said Luong of Ming’s Recycling. But the market for recycled plastic makes it difficult, if not impossible, for recyclers to make any money. The reasons are many. Since plastic is made from petroleum, virgin plastic makers have a large supply of raw material available to them. When manufacturers can buy virgin plastic pellets or flakes for about the same amount of money as recycled plastic, there is little incentive to use recycled (the italics are mine!). Plastic recyclers must also face the issue of contamination. Recycling the number 1 (PET) plastics — the soda bottles — could work economically were it not for the number 3s that enter the mix, said Peter Anderson, a recycling consultant in Madison, Wis., who has worked with state and federal agencies, including the U.S. Environmental Protection Agency and the state of California. Number 3 plastics are polyvinyl chloride, or PVC for short. “PVC presents enormous problems because it looks just like PET physically,” Anderson said. “A single bottle of PVC will contaminate the entire [10,000-bottle] load” aesthetically, causing the new PET bottles made with the material to be yellowed or, with more contamination, to have black streaks, he said. There are X-ray scanning machines that can detect the PVC intruders, but those are too expensive for many recyclers. Some recyclers take the 3 through 7 plastics because, they reason, they’ll get more of the “good stuff” — the soda bottles and milk bottles — if they advertise that they accept a wider range of recyclables. Eel River Disposal in Fortuna, for example, accepts numbers 1, 2 and 3, which they send to Smurfit Recycling in Oakland. Eel River owner Harry Hardin said he doesn’t collect enough of the number 3s to make a separate bale with it, so he bales it with the number 2s. “I even put some 4s in there,” he said. Another Humboldt County recycler sells his material to a middleman in a different part of the state. The man, who did not want to be identified, said he does not collect enough 3 through 7 numbered plastics to bale them separately, so he mixes them with the bales for the numbers 1 and 2. “Don’t advertise that,” he said. “It’s garbage plastic, but a lot of people like to recycle it.” His company then sells it to a broker who sends it overseas. “If they’re putting it in with the PET [number 1s], I guarantee they’re getting thrown out,” said the broker, Patty Moore of the Sonoma-based Moore Recycling Associates. 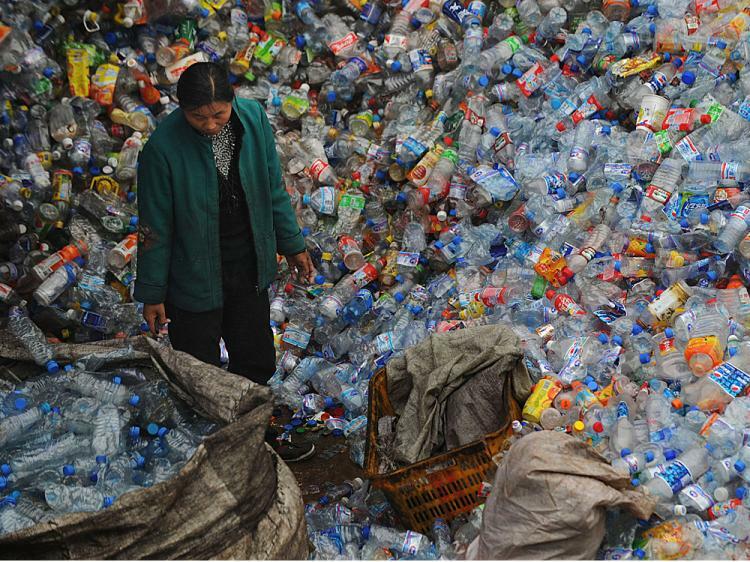 All in all, plastic recycling appears to fall far short of its promise. Even if recycled under the best of conditions, a plastic bottle or margarine tub will probably have only one additional life. Since it can’t be made into another food container, your Snapple bottle will become a “durable good,” such as carpet or fiberfill for a jacket. Your milk bottle will become a plastic toy or the outer casing on a cell phone. Those things, in turn, will eventually be thrown away. “With plastics recycling, we’re just extending the life of a material. We’re not creating a perpetual loop for that material,” like we do with glass and aluminum recycling, said Loughmiller, the Arcata recycling director. If you’ve ever looked on the bottom of your plastic juice bottle, detergent bottle or tofu tub, you’ve seen the little triangle of arrows with a number inside. That symbol — contrary to popular belief — does not indicate that a container is recyclable. Back in 1988, “the trade groups managed to get into law the resin [type of plastic] identification,” said Mark Loughmiller, executive director of the Arcata Community Recycling Center. The numbers indicate which category of plastic the container is made from. “The triangled arrows imply recyclability,” Loughmiller said. “The plastic industry denied it was trying to mislead the public and cause confusion.” But that’s what happened, he said. People regularly come to his center and demand to know why their plastic lawn chair with a number on the bottom can’t be recycled. And why can’t it? 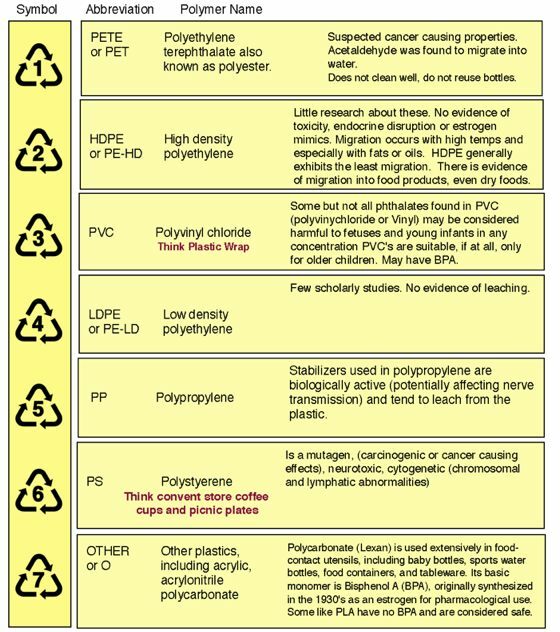 Because, even in one category, such as plastics labeled with a number 2 (high density polyethylene or HDPE), there are many variations. Milk jugs and yogurt containers, for example, may both be made with HDPE, but because the recycling process requires melting of the old containers, and they melt at different temperatures, they may be incompatible. Yet there seems to be no end to our demand for plastics. 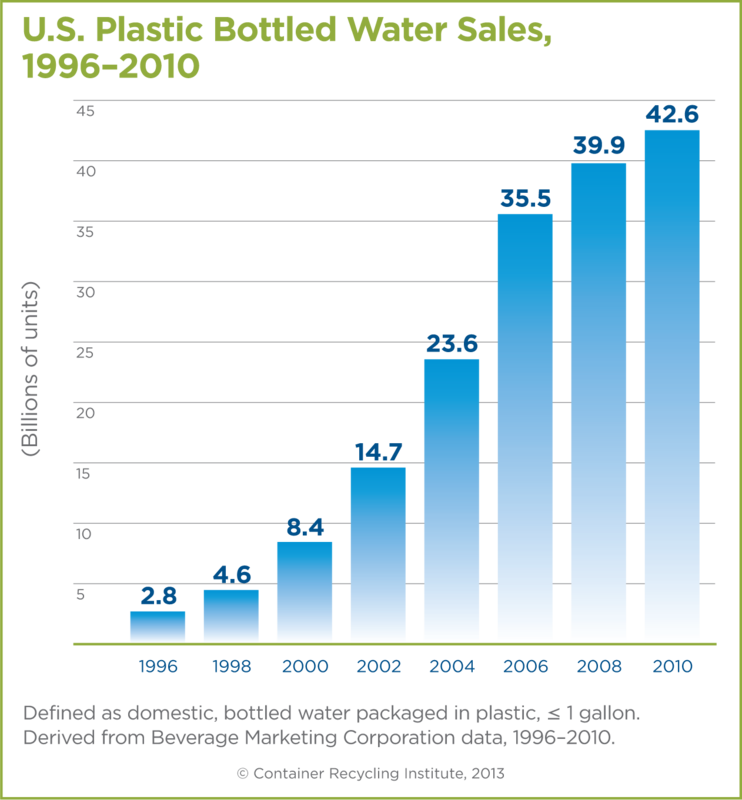 In one year alone, from 1995 – 96, plastic packaging increased by 1,000,000,000 lbs. And despite recycling efforts, for every 1 ton increase in plastic recycling, there was a 14 ton increase in new plastic production. I tried to explain some of the roadblocks to plastic recycling efforts. We have all heard that recycling is good for the environment, and it’s hard to argue with the intuitively correct reasoning that if we recycle we reduce our dependence on foreign oil, we conserve energy and emissions and we keep bottles out of the landfills. And what about the lighter weight of plastic bottles? Surely there are benefits in shipping lighter weight bottles – giving plastic bottles a lower overall carbon footprint? Well, here’s the thing: there are environmental trade offs, just like in life. Even if we accept that plastics are more carbon efficient than alternative materials (glass) in transportation, we’re still talking about vast amounts of carbon emissions. Plastics use releases at least 100 million tons of CO2 – some say as much as 500 million tons – into the atmosphere each year. That’s the equivalent of the annual emissions from 10 – 45% of all U.S. drivers. Plastic manufacturing also contributes 14% of the national total of toxic (i.e., other than CO2) releases to our atmosphere; producing a 16 oz PET bottle generates more than 100 times the amount of toxic emissions than does making the same size in glass. But the critical point is that it’s definitely cheaper to ship liquids in plastic rather than in glass. And it’s also cheaper for manufacturers to use virgin plastic than a recycled plastic. These rather alarming CO2 numbers could be much lower, we understand, if only Americans recycled more than the paltry 7% of plastic which is recycled today. We could cut our usage of virgin material by one third – and that means an annual savings of 30 to 150 million tons of CO2. So why aren’t Americans recycling more? Although our plastic consumption has grown by a factor of 30 since the 1960s, recycling has grown by a factor of just two. Is this just because we don’t take the time to separate recyclable plastics from general waste, or because we don’t take the time to throw the bottle into the proper recycling bin? What about companies that use the plastic – they are not clamoring to spend more to use recycled plastic (again that bugaboo “cost”) so they continue to demand virgin plastic. According to many, these codes just gave plastic an environmental patina, which the industry was quick to use. “Several states have postponed or backed off from restrictive packaging legislation as a result of the voluntary coding system” – this gleeful statement from a 1988 newsletter of the Council on Plastics and Packaging in the Environment. Here’s the irony: it was the veneer of recyclability – cultivated by the plastics industry – that led to this explosion of plastic use. The plastics industry, spearheaded by the American Plastics Council (APC), has sponsored campaigns to convince the public that recycling is easy, economical and a big success. They are a “responsible choice in a more environmentally conscious world”, according to the APC. Between November 1992 and July 1993, the APC spent $18 million in a national advertising campaign to “Take Another Look at Plastics.” (Environmental Defense Fund, October 21, 1997, “Something to hide: The sorry state of plastics recycling.”) Examples of how plastics “leave a lighter footprint on the planet” include the argument that plastic grocery bags are lighter and create less waste by volume than paper sacks, the industry said. And the fact that plastics are so lightweight and durable enables manufacturers to use less energy and generate less waste in production processes, plastic promoters said. In addition to the American Plastics Council, the American Chemical Council (ACC) also spends millions to defend the chemicals produced by their members to make plastics. – including lobbying against any bills that would add a few cents to each bag or bottle to encourage returns and recycling efforts. According to Lisa Kaas Boyle, Board Member of Heal the Bay, the ACC has hired the same advisors who defended the tobacco industry to formulate a strategy to promote and defend the petrochemical industry. That strategy is based on preventing legislation to curtail single use plastics (SUPs – i.e., soda bottles etc.) and to generate positive press on the promotion of recycling as the solution to plastic pollution. This approach makes the industry look environmental while continuing with business as usual. Because most manufacturers don’t take back their products, there’s often little opportunity to sell collected plastic. It is true that the West Coast is blessed with domestic and overseas markets that have made recycling of #1 and #2 plastics – soda bottles and milk jugs – somewhat easier. But even here, metals and paper are the real money-makers. Like McCarthy’s operation, many recyclers will collect plastic only to meet contractual requirements from government agencies. The impetus to collect certain types of plastic comes from residents. But these plastics often have no market for reuse. Recyclers call it “junk plastic,” – stuff that gets collected only “because residents wanted it collected because they watched the commercials on TV extolling the recyclability of plastic,” said one recycling official who insisted on anonymity. In Europe, plastic recycling rates hover around 16.5%, largely because there are strict regulations from Europe’s “End of Life Directive”, in which manufacturers must take more responsibility for the processing of waste from their products. In the U.S., efforts come largely from voluntary programs within companies, such as Wal Mart’s campaign to reduce the size of packages and increase their use of recycled materials. The U.S. government is highly unlikely to enact recycling legislation. We in Seattle voted last summer on a citizen sponsored plastic bag tax (we called it a fee) of $0.20 per disposable bag coupled with a ban on Styrofoam. The American Chemistry Council spent more than $1.4 million to defeat the bill – and they succeeded. One aspect of recycling which is little known to consumers is the fact that almost all of the plastics we recycle, regardless of type, end up in China, where worker safety standards are virtually nonexistent and materials are sorted and processed under dirty, primitive conditions. The economics surrounding plastic recycling — unlike those for glass and aluminum — make it a dubious venture for U.S. companies. And man has done well: plastic is ubiquitous in our world today and the numbers are growing. We produce 20 times more plastic today than we did 50 years ago. The production and use of plastics has a range of environmental impacts. Plastics production requires significant quantities of resources: it uses land and water, but the primary resource is fossil fuels, both as a raw material and to deliver energy for the manufacturing process. It is estimated that 8% of the world’s annual oil production is used as either feedstock or energy for production of plastics. How do we cope with this plastic onslaught? It reduces the amount of garbage we send to landfills: Although plastic accounts for only 8% of the waste by weight, they occupy about 20% of the volume in a landfill due to their low bulk density. It conserves energy: recycling 1 pound of PET conserves 12,000 BTUs of heat energy; and the production of recycled PET uses 1/3 less energy than is needed to produce virgin PET. It helps conserve natural resources. There are different costs and benefits for other recyclable items: plastic, paper, electronics, motor oil… They each have their own individual problems. With reference to the textile industry, 60% of all the virgin polyethelene terephthalate (PET) produced globally is used to make fibers, while only 30% goes into bottle production. As I explained in a previous blog, the textile industry has adopted recycled polyester as the fiber of choice to promote its green agenda. What I want to do is expose this choice for what it is: a self-serving attempt to convince the public that a choice of a recycled polyester fabric is actually a good eco choice – when the reality is that this is another case of expediency and greed over any authentic attempts to find a sustainable solution. My biggest complaint with the industry’s position is that there is no attempt made to address the question of water treatment or of chemical use during dyeing and processing of the fibers. 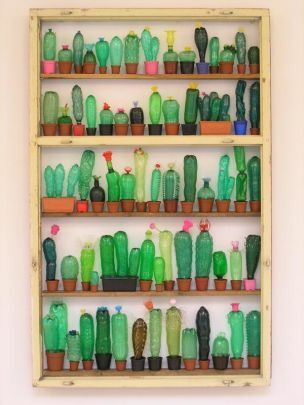 So to begin, let’s look at what plastic recycling means, since there are many misconceptions about recycling plastic – especially plastic bottles from which (some) recycled polyester yarns are made. 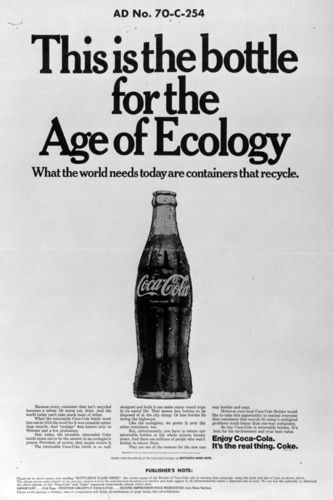 In 1970, at the time of the first Earth Day, Gary Anderson won a contest sponsored by Container Corporation of America to present a design which symbolizes the recycling process. His winning design was a three-chasing-arrows Mobius loop, with the arrows twisting and turning among themselves. Because of the symbol’s simplicity and clarity it became widely used worldwide and is a symbol now recognized by almost everyone. Today almost all plastic containers have the “chasing arrows” symbol. We’re bombarded with that symbol – any manufacturer worth his salt slaps it on their products. But the symbol itself is meaningless. 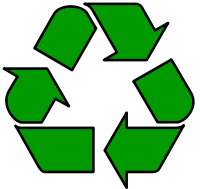 This symbol is not a government mandated code, and does not imply any particular type or amount of recycled content. Many people think that the “chasing arrows” symbol means the plastic can be recycled – and that too is untrue. The only useful information in the “chasing arrows” symbol is the number inside the arrows, which indicates the general class of resin used to make the container. There are thousands of types of plastic used for consumer packaging today. In 1988, the Society of the Plastics Industry devised a numbering system to aid in sorting plastics for recycling, because in order to be recycled, each plastic container must be separated by type before it can be used again to make a new product. Of the seven types, only two kinds, polyethelene terephthalate (PET), known as #1, and High Density Polyethelyne (HDPE) – or #2 – are typically collected and reprocessed. Some of these resins are not yet recyclable at all (such as #6 or 7), or they’re recyclable only rarely. 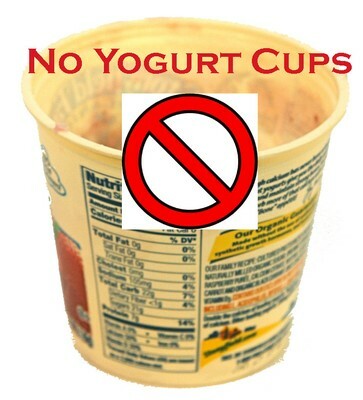 In addition, a resin code might indeed indicate #1 (PET) for example, but depending on the use (yogurt cup vs. soda bottle) it will contain different dyes, plasticizers, UV inhibitors, softeners, or other chemicals. Consumers see the symbol and – thinking it means the plastic can be recycled – drop bottles into recycling bins, feeling they’ve “done their part” and that the used bottle is now part of the infinite loop, becoming a new and valued product. But does the bottle actually get “recycled”, returning to a high value product, staying out of the garbage dump? A bottle can become a fabric, but a fabric can’t become a bottle – or even another fabric, but we’ll get to that later. There are far too few exceptions to this rule. Plastic has what’s called a “heat history”: each time it gets recycled the polymer chains break down, weakening the plastic and making it less suitable for high end use. PET degrades after about 5 melt cycles. This phenomenon, known in the industry as “cascading” or “downcycling,” has a troubling consequence. It means that all plastic – including the tiny proportion that finds its way into another bottle – “will eventually end up in the landfill,” said Jerry Powell, editor of Plastics Recycling Update. The technology exists to recycle most kinds of plastic, but a lack of infrastructure prevents all but the most widespread kinds of plastic from being recycled. Collection is expensive because plastic bottles are light yet bulky, making it hard to efficiently gather significant amounts of matching plastic. For recycling to work, communities must be able to cost effectively collect and sort plastic, and businesses must be willing to accept the material for processing. So no matter whether a particular plastic is in a form which allows it to be melted and reused, something is only recyclable if there is a company out there who is willing to use it to make a new product. If there is no one who will accept the material and make a new product out of it, then it is not recyclable. Only a few kinds of plastic have the supply and market conditions that make recycling feasible. With plastics in particular, how the plastic particles are put together (molded or extruded) changes their chemical make up and make them non recyclable in certain applications. Some bottles make it to a recycler, who must scramble to find a buyer. The recycler often ends up selling the bottles at a loss to an entrepreneur who makes carpeting or traffic strips – anything but new bottles. Recycling reduces the ecological impact of plastic, but it remains more complicated, more expensive and less effective than other parts of the recycling industry. No matter how many chasing arrows are printed on plastic products, it doesn’t change the fact that plastic is largely a throwaway material. Next week: what is the plastic industry doing to create a stronger recycling market for its product?